We had not been married for a long time yet. I suppose had I been a bit wiser I might have known that what I was about to do could lead Betsy to wonder what she had gotten into. There they were, sticking right out of the dumpster, two beautiful 6” x 6” pressure treated posts waiting to be re-homed. I could imagine them perfectly placed in our landscaping to keep the dirt from washing away. God is a dumpster diver. 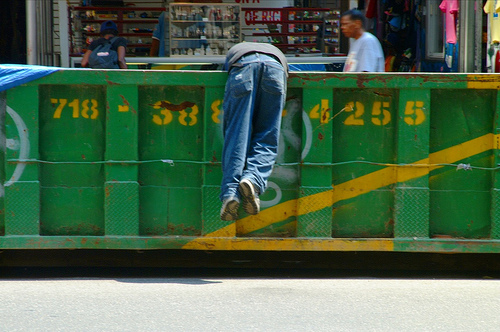 Yes, God IS a dumpster diver. He dove after Moses, David, Rahab, Paul, and a whole lot of other people that had been thrown away. Moses was a murderer, David too small and scrawny, Rahab was a ‘woman of the night’, Paul a religious, narrow-minded persecuting zealot. All of them were damaged goods. All of them had been ‘thrown away’ by their families, their nations, their national leaders and in general, by any self respecting person of their day. They were the refuse in the dumpsters of society. Jesus was criticized because He frequented the homes of outcasts, ate and drank with them. It’s hard to find anyone in the Bible who accomplished much of anything who was not thrown away by those who knew them best. But God sees in us what other people don’t see. God sees in us what we don’t even see. God sees all that we were made to be and He sees all that we still can be. Until the dumpster is hauled off and its contents burned in flames, those who have been thrown away, seen as not much count, are still valuable to God. I think He searches the dumpsters of the world looking for those that everyone else has given up on. When He gets His hands on them, they become something of beauty to behold!